Review: This smartphone is designed to take great selfies, but is that enough? Huawei is making a significant push to become one of the top players in the European smartphone market, but is the Ascend P7 the phone that will kickstart this change? HUAWEI IS A company on a mission. Usually associated with low and medium range phones over in this part of the world, the Chinese company is aiming to become a major player in the smartphone market, and is putting serious effort into its high end range. 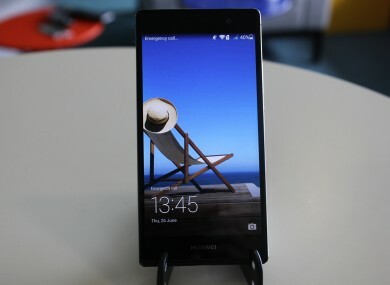 Huawei’s first 4G smartphone, the Ascend P7, aims to be a cheaper alternative to Samsung’s Galaxy range and the HTC One (M8), but offering the same quality and experience. Yet it is a worthy rival to the Galaxy S5? 13MP camera and 8MP front facing camera. Phone management system for improving battery life & freeing up memory. The Ascend P7 doesn’t deviate too far from the design most Android phones follow. The now traditional 5-inch screen is crisp, and is the right size for watching a show on Netflix or playing games. The phone is eloquently designed, using steel casing with a glass front and back, and makes it feels like a flatter version of the iPhone 4S. That’s not a bad thing by any means, the phone feels solid in your hand and it’s just the right weight. The changes Huawei made to Android KitKat are purely cosmetic – at best it’s brighter and more colourful than the traditional Android look – but it can feel a little bland and it will take you a few moments to get used to the changes made with the interface. Its performance, for the most part, is above par, with the only instance of lag occurring the few moments after you boot up the phone. Unless you turn your phone off regularly, this won’t be much of an issue, and it does a good job in running the more intensive apps out there. With a 13MP camera, you expect the quality of photos taken to be good, and you would be correct. Considering it’s one of the phone’s main selling features, Huawei has gone all out in ensuring the camera app is the only one you need thanks to a rather comprehensive selection of editing tools. You do have to be a little careful with lighting as high-quality photos on your phone may not translate well on a computer, but provided you get the focus right, it’s quite impressive. The real draw, however, is its 8MP front-facing camera, means the phone is geared towards one thing: selfies. Huawei ended up trademarking the term ‘groufie’ (that’s a selfie of a group for those who didn’t know) which shows how much importance it’s placing on the trend, something that prevalent in both the camera and editing tools available. The first example you will encounter is beauty mode, an option of the camera which can detect your face and gently blurs the skin to provide a smoother look. It’s a strange feature to have initially, but it’s really an introduction to the facial editing tools it has in store which allow you to make your face thinner, your nose smaller or increase the size of your eyes. While it’s bizarrely fun to play around with these features, they’re really designed for those who are self(ie) obsessed. It works whenever it detects a face in a photo, so it has its uses if you happen to take a photo of someone in poor lighting. Apart from its front facing camera, one useful feature that the P7 has is its management system, which helps improve battery life, phone speed, and free up space. While similar apps can be easily downloaded from the Google Play store, or are hidden deep within settings, it’s great to see such a feature made front and centre of a device and is an example that other manufacturers will hopefully follow. Ultra power saving mode is also a nice idea, a feature already included with the Samsung Galaxy S5, but while Huawei says it will provide 24 hour standby on 10% battery power, the results are less impressive. Battery life in general will last you a good day through normal use anyway, but a phone with only 20% charge will last you roughly twelve hours in standby mode, meaning you will still need to keep your charger handy. The Ascend P7 is a good phone, make no mistake, but apart from its forward-facing camera, it lacks any standout feature that separates it from its competition. Yet that’s not really the point. Everything the Ascend P7 does, it does well and for most people, that’s all that really matters. Provided you’re not fussy about what phone you’re using, the Ascend P7 is a smartphone you can definitely warm to. Just don’t expect it to change your world. The Huawei Ascend P7 costs €379 (pre-pay) and is available in Carphone Warehouse on Vodafone and Meteor networks. Email “Review: This smartphone is designed to take great selfies, but is that enough? ”. Feedback on “Review: This smartphone is designed to take great selfies, but is that enough? ”.